New V8, ZF auto and clever engineering make this Maser a winner. 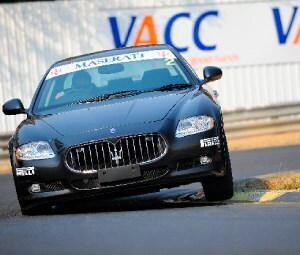 If you’re not up to speed on Maserati’s current status in the Australia, then let us educate you. Maserati sold 201 cars in 2008, which ranks the brand second overall in the $200K-plus Sports Car segment, behind Porsche...and ahead of Aston Martin, Audi, BMW, Lamborghini and Mercedes-Benz. Oh, and Ferrari. The brand’s growing, the product has improved of late, and Maserati Australia proactively hits its carefully defined ‘executive’ target market through regular racetrack drive days and other smart buyer-reaching activities. But the core reason goes much deeper: Maserati knows its customers’ wants. Take the specs of the 317kW 4.7-litre V8 newly introduced to the Quattroporte S, for instance, to see how accurately Maserati has taken aim at its buyers. The new engine, the first in an emerging family, has been specifically developed with a wet-sump lubrication system. Yet the same engine was already available in Alfa’s gorgeous 8C, but with a more performance-focused dry-sump arrangement. So why the costly downgrade? Well, it all comes back to the reason why dry-sumped engines have become popular. Firstly, they afford a lower centre of gravity, as the removal of the sump allows the engine to be dropped into the engine bay. And, secondly, they provide more consistent lubrication under extreme driving conditions, like on a racetrack. Neither of these is going to impact on your typical Maserati owner, who primarily lusts for a swift and extravangantly comfortable GT. See, they’ll get a bigger kick out of the NVH advantages the wet-sump set-up offers on the open road. So it’s ironic, then, that our only flog in the grown-up Quattroporte S was around Sandown Raceway. Here, the Skyhook suspension system (with adaptive dampers that temper pitch) managed the Quattroporte’s considerable size and weight well. Good balance isn’t that surprising, though, with a front/rear weight distribution of 49/51. The huge Brembo-developed brakes provided powerful, lasting stopping power, and the V8 delivered its grunt expertly through the new ZF six-speed auto. And it sounds deliciously brutal doing so – especially above 5000rpm. With the ESP switched on we found the calibration to be a little cautious, but again, that should suit the less demanding Maserati buyer. New LED lights at all four corners form part of the tweaked Pininfarina design in the new model. But the overall stance still looks tough, and is especially menacing from the front. There’s lots to like about the new Quattroporte, which is why buyers are keen to snap them up. It’s a sensible executive’s choice while still offering plenty of sporting ability and heritage. At $323,800, the S costs $38K more than the garden-variety Quattroporte, but you get 20-inch wheels, the Skyhook suspension system and the mighty soundtrack of the 4.7-litre V8. Did someone say financial crisis?